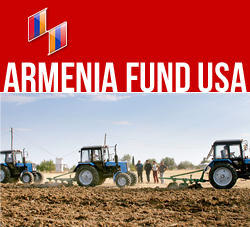 NEW YORK, New York — Between March 10 and 31, the Hayastan All-Armenian Fund held a series of juried competitions in Yerevan to select finalists for the 2010 President’s Youth Prize. Now in its seventh year, the President’s Youth Prize is sponsored by the France-based Boghossian Foundation. Out of a pool of 116 candidates who competed in the categories of Vocal Performance, Instrumental Performance, Literature, and Fine Arts and Filmmaking, 42 outstanding young talents made it to the final round. The jury will select the winners, presenting them for the endorsement of the president of the Republic of Armenia. The prize recipients will be announced during an awards ceremony, which will be held at the presidential palace on May 30. The prize comprises a medal, a certificate of achievement, and a monetary award in AMD equivalent to $2,500. President Serzh Sargsyan himself will hand out the prizes and congratulate the winners. Volodya Hakobyan, who was selected as a finalist for his series of paintings titled “I Am the Reality,” said that while all stages of the competition were equally tough, he found them instructive and thought they were a great experience overall. “This is my third time competing for the prize, and I’m extremely eager to win,” Hakobyan said. Commenting on the general caliber of the finalists, Karen Aghamyan, president of the Artists’ Union of Armenia and a juror for the Fine Arts and Filmmaking category of the President’s Youth Prize, explained that candidates who reach the final round are already winners because they all deserve the prize. “It is such a challenge to choose the best among the best,” he said.